Casual café by day, elegant restaurant by night in Brooklyn's Prospect Heights. : Set in rapidly gentrifying Prospect Heights, this airy, spacious bistro wears a few different hats. During the morning and most of the day, it’s a casual café with locals sipping coffee and working on laptops. At night, the menu shifts from sandwiches and salads to slightly more complex fare. 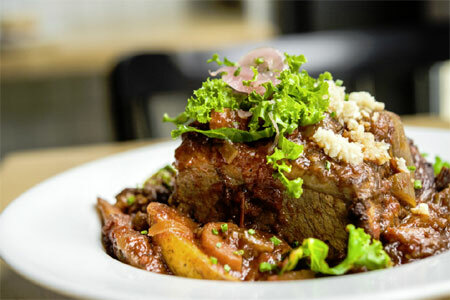 Red wine-braised oxtail with caramelized vegetables is a hearty hit. So is the cumin-encrusted pork tenderloin with mashed sweet potatoes. Saffron-tinged shrimp risotto is a nice choice for a lighter dish. The wine list is very affordable with many bottles in the thirty dollar range.